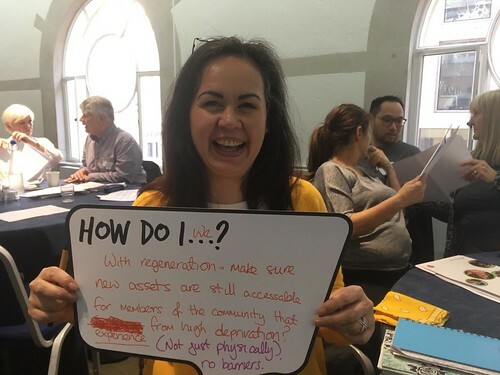 In this blog, Rachel Nye argues that we need to affirm and equip a wide range of people as change makers in their communities. By Rachel Nye, project manager, The Sheila McKechnie Foundation. Acknowledgement is key when thinking about how communities can become more empowered and vibrant in the next ten years. It is very powerful to receive acknowledgement that whatever it is you do to bring about change is legitimate and that you have the ability to do it. Time, money, and resources are often in high demand, but I would like to see more acknowledgement and trust that everyone, whoever they are and whatever their background, is capable of bringing about change. The recently launched Social Change Project, which is part funded by Local Trust, has been on tour around the country. It’s looking to deepen our understanding of how civil society can really create social change and turn intent into positive action. So I have had the pleasure of meeting and spending time with change-makers who are doing vital work to strengthen and empower their communities. Though the range of activities these people are undertaking is diverse, their underlying aim is the same. Whether protecting community assets for the enjoyment of everyone; improving of local infrastructure to make travel more accessible; reducing knife and gun crime; or supporting refugee communities, all of the groups saw themselves as trying to bring about real and positive change through empowering their communities. Not all of these people were trained campaigners, many were citizens who wanted to make things better but all were capable. I believe acknowledgement can play an important role in unlocking potential. Many ‘change-agent’ roles are becoming more professionalised which can leave some feeling like they lack the right qualifications or skills to bring about change. When I came from front-line work to campaigning I often felt like an imposter. I was plagued with doubt about not having the ‘right credentials’ and lacking a mandate to do the work. The fact I went on to co-direct a campaign which brought together a powerful coalition of organisations and changed UK law shows that (with an excellent team) it is possible, but even following that success I struggle to own it. Having spoken with others who have similar experiences I know I am not alone. We know that there is no magic formula for change. It is about a combination of people, places, resources, timing and often luck. Training and mentoring can be useful tools to empower people and there are certain skillsets which can be useful. But what spurs people on most is often a strong sense that doing nothing would be wrong, combined with a belief that change is possible. Recognising and trusting people’s agency, even if they wouldn’t be your usual bedfellows is likely to result in more diverse voices and more involvement across communities. I want to see people with platforms not only acknowledging what others have to bring, but also giving space and support for them to share it. If we want to see social change, this acknowledgment of the potential of others' agency is crucial. Social change needs community involvement. In most cases, communities need to be at the heart of it. It is important to us that the Social Change Project is rooted in the communities of citizens, activists, campaigners and change-makers. Whoever they are, we want to acknowledge their potential and ability, and to encourage the work they are doing.